CinéFemme - Annakarinaland: Long before the Oscars were the BAFTA's--and they chose Brokeback Mountain! Long before the Oscars were the BAFTA's--and they chose Brokeback Mountain! 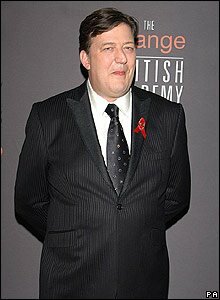 It was a night of surprises, an excellent, gracious and witty host - Stephen Fry who starred in Wilde (1997), as Oscar Wilde. It was also a night to thank George Clooney for stirring up the political volume in film. The highest honor went to producer Lord David Puttnam behind films like The Killing Fields, and Chariots of Fire,with Ben Cross sitting in the audience. Cross starred opposite Ian Charleson in Chariots of Fire (1981) - a film about "two men chasing dreams of glory" at the 1924 Olympics. Charleson died of AIDS in 1990. Putnam applauded the work of George Clooney for themes that had changed the industry in a year – probably the best accolade of the evening. But above all it was a nite for Brokeback Mountain--best script, best adapted screenplay , best supporting actor. "Its not a gay cowboy film", quipped the producer of Brokeback Mountain upon receiving the award for best film. "Its a gay shepard film!" Jake Gyllenhaal got his just rewards for best supporting actor. Jake reports in Premiere last month how hard it was to initiate 'the intimacy' in the film, but not when Ledger and he were wrestling. After all sports are perfectly acceptable homosocial encounters - for spectators and players alike. Observe the fascination for the Olympics. So, if 'love is a force of nature', as the film poster states, why not nominate both actors? The Brits did! Fry's jokes went over well, many about the handsome men in the room and on stage. The awards ceremony was polished and intelligent. Tributes to people in the industry who had passed away was very well made -- with clips from films of among others, Shelley Winters, Sir John Miles and Richard Pryor. Wallace and Gromit: the Curse of the Were Rabbit won best British film. The Constant Gardener, nominated for ten awards took home one award. The awards caused a stir the next day, how can we not reward our own? Not realizing that is exactly what Hollywood would do a couple of weeks later. Cheers to the Brits! "I'm not a lesbian but my girlfriend is...."